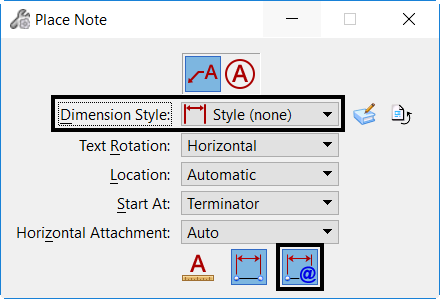 There are two significant changes to the Place Note tool in MicroStation CONNECT. The first change is that the option to select a Text Style setting in the Tool Settings Window has been removed. The Text Style is now set in the Word Processor dialog. The second is the addition of a Relative Association setting. This option is only enabled when the Association checkbox is toggled on. The Relative Association moves the entire note when the associated element is modified instead of just the terminator. Associated Notes before modification of line element. Associated Notes after line has been modified.